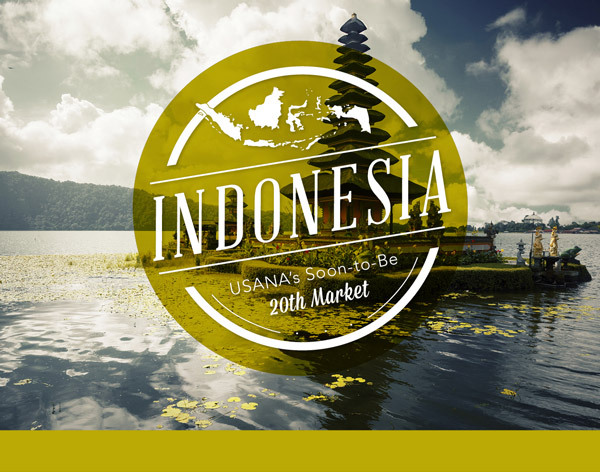 Update: USANA launched in Indonesia on November 15th, 2015. For more information or to enroll in USANA, please click here. We are very excited to announce that USANA will be open for business in Indonesia in the fourth quarter of this year. Indonesia is one of the top five fastest growing economies in the world, and also boasts the world’s fourth largest population. We have been instrumental in opening countries around the world with USANA and our strategy (an extremely successful one) is based on generously rewarding hard work with prizes and incentives. USANA will make a difference in tens of thousands of lives in Indonesia. Please visit our website at: larsenglobal.com and view this short video clip – a peek into our lives. If you love living your dreams while helping others do the same and if you’re open to transformation and creating abundance in all areas of your life, please contact us immediately. We will get back to you so we can discuss the possibilities of partnering with you in Indonesia. Read USANA’s press release on Indonesia. Please bookmark this page as we will post updates on USANA’s opening of Indonesia as we receive them. Just sent you an email with some useful links. We look forward to speaking with you. How do i contact you ? You can see our products at https://larsenglobal.usana.com/mvc/pwp/websites/1001076/shopForward. If you would like, email me your contact information at info@larsenglobal.com and I will send you more information. Thank you for your interest. More information is on its way. More information is on its way. Thanks for contacting us. Information is on its way. Thanks for getting in touch. I want to join , how the way ? and what benefits for me ? Hi Efrini. I just sent you an email. Thank you for contacting us. I heard USANA going to open in indonesia within this year. How i could joun usana? How is the compensation plan will be in indonesia? Is going to be the same as in the states and other country? Where are they going to open the office….need the info …..the earlier the better opportunities right…..please mail me for further detail information..thank you. Your quick response are appreciated. Rizky. Thanks for your comment and questions. I have just sent you an email that will help answer your questions. I consumed USANA Essential TM, and interest to join, please send me the details Thanks.. When usana open in indonesia? i am interesting Usana, when Usana will be open in Jakarta? How do I join Usana Multi Level Marketing? Please give me some information. How can i join usana at indonesia? what is usana exactly? and what is the benefit to join usana? how to join in Indonesia? can u send me about benefit Usana and Marketing plan. I have just sent you an email with USANA’s compensation plan. Please inform me when the product is available in Indonesia. Information is on its way. Thanks for your inquiry. Hi !You can contact me thru facebook http://www.facebook.com/ladygreen.imer whoever wants to be an independent associate of USANA our team here in the Philippines will be so happy to share to you how you can build your own business with USANA it will be easier for everyone of you because we will be your guide to be a auccessful USANA independent associate hoping to be reading some messages coming from you in my facebook account thank you! Can u sent me about marketing plan and benefit products of Usana? Hi Collette Larsen, I join last month under your USANA network from Dr Monica Lewis, I join because i have huge contact in Indonesia and I will work very hard to build maximum business for you. Kindly help me to and give me opportunities to help. Thank you & I love you ! Hi!you can contact me thru this site http://www.facebook.com/ladygreen.imer whoever wants to be an independent associate of USANA our team here in the Philippines will be so happy to share to you how you can build your own business with USANA it will be easier for everyone of you because we will be your guide to be a successful USANA independent associate hoping to be reading some messages coming from you in my facebook account thank you! Hi! You can contact me in facebook http://www.facebook.com/ladygreen.imer whoever wants to be an independent associate of USANA our team here in the Philippines will be so happy to share to you how you can build your own business with USANA it will be easier for everyone of you because we will be your guide to be a successful USANA independent associate hoping to be reading some messages coming from you in my facebook account thank you! I want join usana,how to join usana sir? Contact me I’m in Jakarta for 1 year 081290336379. I’m a Gold Director. 1. How much is the fee to become a distributor? Is there annual Fee? 2. Can we purchase as customer? Is there annual Fee too?